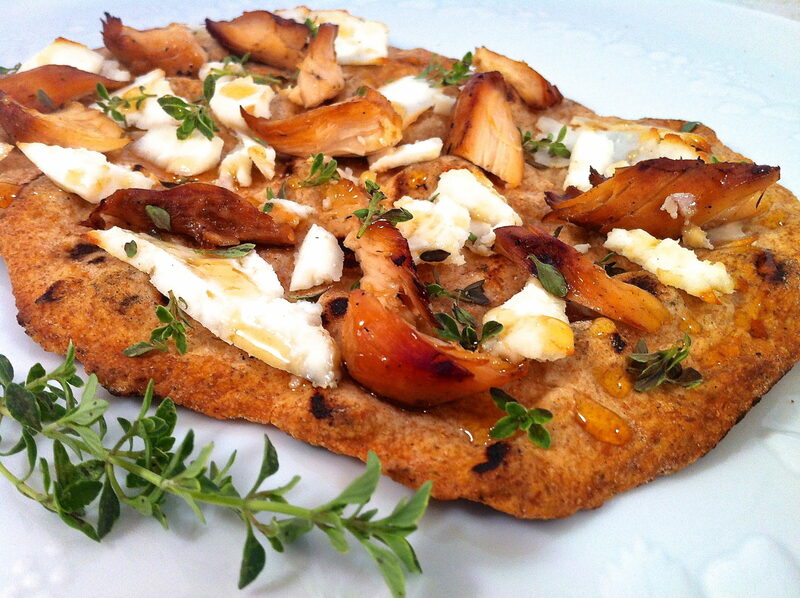 Years ago, a friend who runs a local cooking school called Essen suggested topping a grilled pizza with Manouri cheese, honey, and thyme. Manouri cheese is a Greek goat’s milk cheese with which I was not familiar at the time. What threw me, however, was the honey. Honey on pizza? I like to mix sweet and savory flavors in salads, however…so why not on pizza? As it turned out, the combination was outstanding, and I have made a similar pizza many times in the years since. When I threw leftover Lime Honey Chicken into the mix, I was thrilled. The added protein made the pizza into a hearty meal and the flavor combination was sublime. Feel free to use a grilled pizza crust–I love the whole wheat version–or your favorite store-bought crust or flatbread. I like to grill extra Lime Honey Chicken one night and use the leftovers for the pizza later in the week. This pizza is a perfect way to stretch a piece of leftover chicken–especially my favorite Lime Honey Chicken–into a second meal. There is no need to measure the ingredients. With the chicken and cheese, top as lightly or heavily as your taste buds and appetite dictate. I do keep the drizzle of honey light but thorough. Chopping the thyme will release more of the herb’s flavor and a light touch of sea salt is the perfect finishing touch! Cook the pizza crust according to the recipe directions. Top with the desired amount of chicken and cheese. Heat in a 400-degree oven for 3-4 minutes. Remove the pizza from the oven and drizzle the honey lightly over the entire pizza. Sprinkle with chopped thyme and sea salt to taste. Locally, I buy the Manouri cheese at Mandros. This looks amazing. I love goat cheese but I’ve never heard of Manouri cheese before, I must look for it. Simple things are the best! I hope you can find it, Jennifer. Manouri is delicious all by itself, too! And I agree…simple things are often the best! Nice combination of flavours. Thanks for sharing this. Thank you, Bert, and I am glad you found my site. I promise there will be more recipes to come…and I hope you enjoy!